"Power to the people" finally on underway; President George Manneh Weah signs Local Government Act (LGA) into Law. Monrovia, September 19, 2018: President George Manneh Weah has signed into law the Local Government (LGA). The LGA is a cardinal legal instrument that is considered germane to the Government’s Pro-Poor Agenda for Prosperity and Development. Recently, the 54th National Legislature passed the Act into Law following years of scrutiny by the 53rd Legislature apparently aimed at fine-tuning the LGA to be in line with current national and international realities. The Local Government Act was introduced during the administration of former President Ellen Johnson Sirleaf. President Weah signed the Act into Law on Wednesday, September 19, 2018 in the C. Cecil Dennis Auditorium at the Ministry of Foreign Affairs in Monrovia. The Local Government Act provides the legal and regulatory framework for Decentralization and Local Governance reforms in Liberia, which is being implemented through the Liberia Decentralization Support Program (LDSP), with funding from the European Union (EU), Swedish Government, USAID, UNMIL and UNDP. 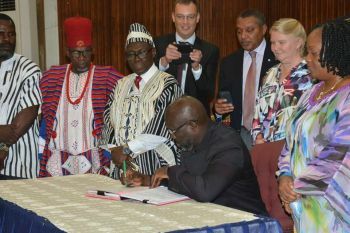 In brief remarks, President Weah said he was happy to sign the instrument into Law, which according to him he worked on during his tenure at the Senate and noted that the LGA is also important for the development of the country and the well-being of its citizens. “To develop our country, we have to do the right thing for our people; and I think, among the things we proposed, this is the key component while we anticipate other development initiatives.” The Liberian Leader reemphasized. President Weah then thanked both Houses of the National Legislature for the collaboration that led to the successful passage of both Act. Senior government officials, Traditional leaders, county superintendents, Members of the Diplomatic and Consular Corps, representatives of the civil society as well as a cross-section of Liberians attended the signing ceremony; the second to be performed by President Weah since he assumed the Presidency a little over eight months ago.